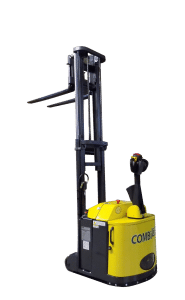 Pedestrian walkie stacker lift trucks are ideal for small warehouses and storerooms. They’re a safe and economical option for lifting and handling in tight spaces. These walkie stackers function indoors or out. 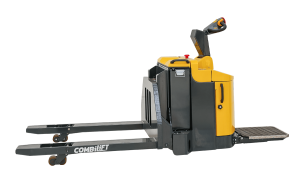 Your staff can handle standard pallets and awkward, long loads with ease and efficiency. 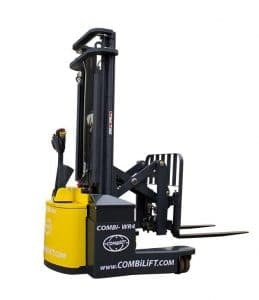 Fill out the form below and one of our material handling experts will contact you to schedule a free live demonstration on one of our Comblift forklifts. 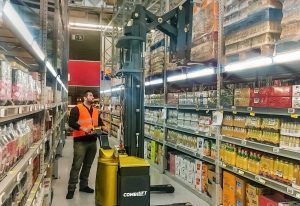 The Combi-WR is a walkie reach stacker and is perfect for very narrow aisles. This is the only walkie stacker that can operate in a aisle width of 6 feet . This walkie stacker is designed to be very operator friendly. The patented tiller arm allows the operator to smoothly pick from the side of the machine opposed to standing directly behind the machine and between the rack. This provides the operator a safer position. There’s also better visibility when the operator picks the load from the side of the reach truck. 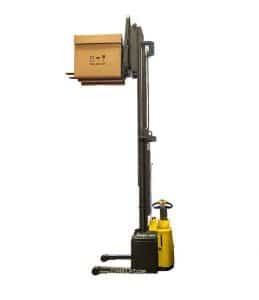 The Combi-WR4 is a 4-way pedestrian reach stacker which combines multi-directional travel with features such as a pantograph reach, side shift and tilting fork carriage for handling long loads and pallets in very narrow aisles and is able to work in aisle widths of 83 inches pallet to pallet. With its unique patented multi-positon tiller arm, electronic power steering and fingertip controls it’s easy and effortless to operate. Push button control rotate the rear wheel parallel to the chassis and back again which reduces the need for leaning, reaching and bending and minimizes general manual strain when picking and placing loads.